Take the hassle out of regulatory and e-discovery compliance. Barracuda archiving solutions makes it simple to create, maintain, and search secure, immutable email and IM archives, while slashing storage costs and giving all users access to archived email. Scroll down to see how it works, what it does, and why customers and industry analysts love it. I check the Message Archiver periodically to make sure there are no issues, but that’s it... Searching is extremely easy and fast with the Barracuda Message Archiver. The City of Lebanon’s IT director was overwhelmed with managing email archives for regulatory compliance using the Exchange server. 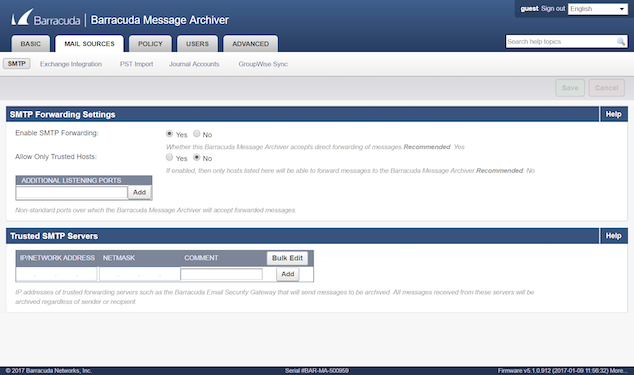 Barracuda Message Archiver made it easy and automatic. Pickens County School District Director of Technology Andy Coleman was spending way too much time searching for subpoena-required emails. With Barracuda Message Archiver, e-discovery is a breeze. The Panthers Group was growing fast, and older, ad hoc systems for storing and recovering critical business data couldn’t keep up. 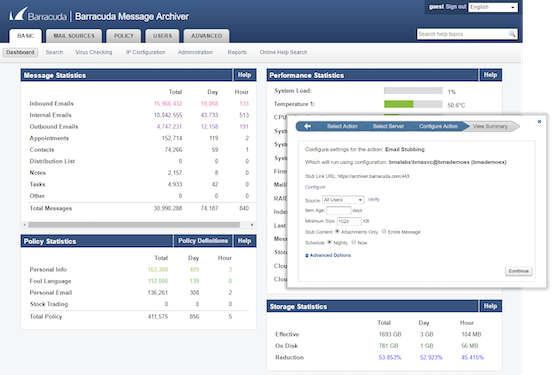 Barracuda Message Archiver delivered the features and scalability they needed. We set up the appliance, turned it on, and it just started working. 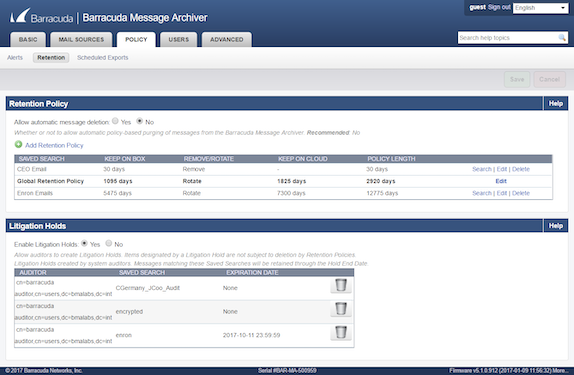 The Barracuda Message Archiver has been perfect since day one! SMTP journal capture ensures an accurate and unmodified copy of each email is secured the moment it is sent or received. Works with Office 365, G Suite, and traditional mail servers such as Exchange and GroupWise. Scheduled tasks can be set up to import existing email automatically from Office 365 or Exchange, and to archive non-email items such as appointments, contacts, tasks and notes on a regular basis. Granular retention policies ensure that original data is kept for as long as needed, in a dedicated, secure, immutable archive. The intuitive, role‑based interface and multi‑level full-text search support complex audit and e‑discovery tasks, with selected data preserved on legal hold for as long as needed. 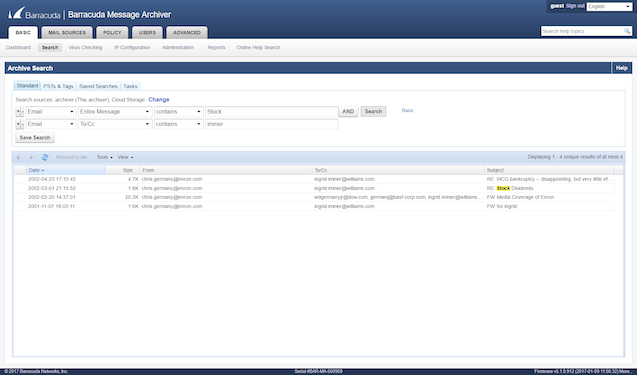 Predefined user roles are provided to manage end user access to archived data and system features. 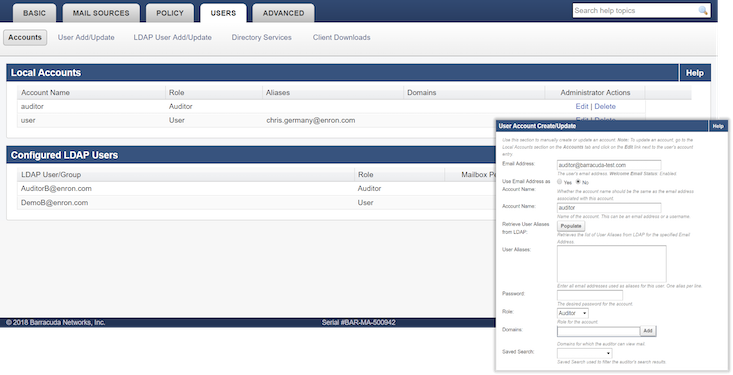 Granular access permissions for auditors can be configured to restrict access to specified subsets of data. The multi‑function add‑in for Outlook, together with mobile apps for iOS and Android, plus a desktop client and a web portal, ensure end users have immediate access to their email from any device at any time. 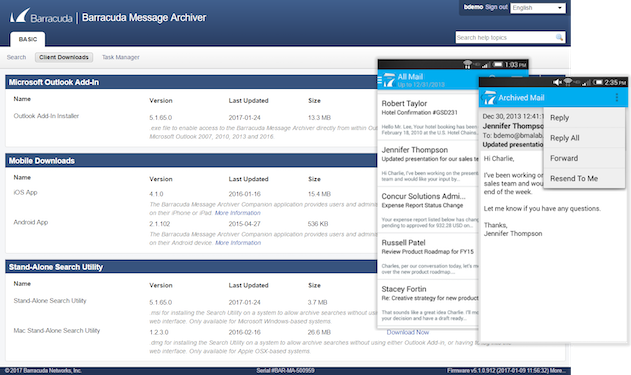 The Message Archiver provides full message deduplication, compression, and optional message stubbing. These features combine to reduce email storage volume, shrink backup windows, and eliminate the need for PST files. 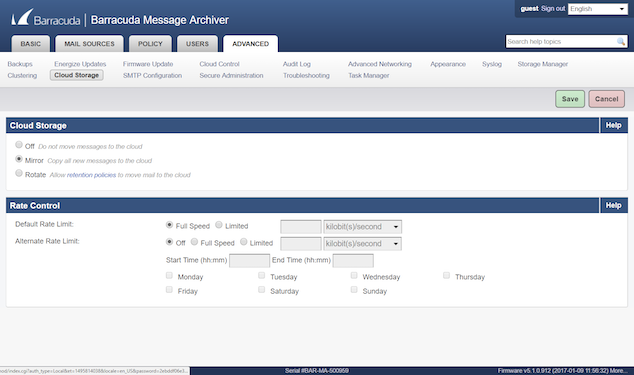 The Message Archiver can mirror archived data to the Barracuda Cloud for secure off‑site data retention and storage, and to facilitate disaster recovery.